Should say six floors up not sixty. Fix it when I can. I'm with you D ! 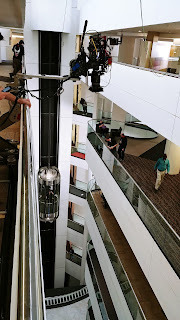 I rigged a small Jib arm off a service balcony on the 68th floor of the Petronas Towers in Kuala Lumpur. I tied everything I could down, but it was still a sphincter tightening moment when I swung that arm out. From that height a nut or bolt becomes a bullet.